Every day, Watch This offers staff recommendations inspired by the week’s new releases or premieres. This week: HBO’s The Casual Vacancy has us thinking about other book-to-TV adaptations. An awful finale on top of an awful final season has curdled the legacy of Showtime’s Dexter, which is a shame—in its early goings the show was capable of genuine highs. Few episodes of Dexter make that as clear as the season-one finale, “Born Free,” the conclusion to the series’ most consistent and tightly focused narrative. 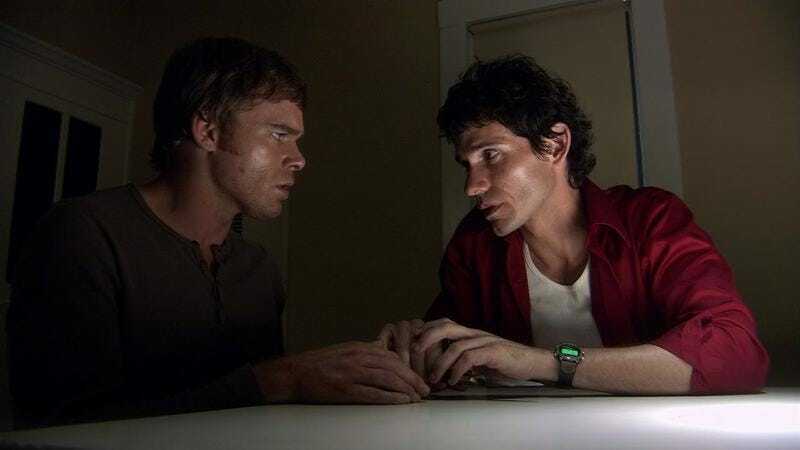 Largely adhering to the original Jeff Lindsay novel Darkly Dreaming Dexter, the cat-and-mouse game of Dexter Morgan (Michael C. Hall) and the Ice Truck Killer (Christian Camargo) makes for compelling mystery that peels back more sides of Dexter’s psychology the longer it goes on. The arc pays off in terrific fashion in the finale, and its presentation is as compelling on screen as on the page, Dexter eventually making his way to the truth: The Ice Truck Killer is none other than his long-lost brother Brian. As with the book, the idea Dexter even has a brother is kept under wraps until the very end. Because Dexter and the audience learn the truth simultaneously, it comes across as a genuine surprise, rather than a contrived twist. And seeing the two side by side arguing their worldviews—over the trussed-up form of Dexter’s foster sister Deb (Jennifer Carpenter)—elevates their conflict from sibling rivalry to a reflection on the roles nature and nurture played for both men, the way their bloody past created a shared experience impossible for anyone else to comprehend. “Born Free” also takes the important adaptation leap and distances itself from its source material the right way, with a tighter focus on the twisted family triangle created between Dexter, Brian, and Deb. It’s the closest the show gets to matching the nonstop cadence of thought in Dexter’s head, Hall’s performance and voiceover in tandem making it clear how much planning and pain goes into this. His voice genuinely cracks as he says of his sister “I’m very… fond of her,” and he’s later reduced to a sobbing wreck as Brian’s life drains out. Like Dexter as a whole, it isn’t perfect, with the novel’s reliance on first-person narration keeping most of the secondary characters from finding their footing as individuals. However, the emotional impact of the Ice Truck Killer resolution—and Dexter’s final contemplative monologue as he makes his way to analyze the crime scene he created—is enough to overwhelm those flaws, it’s as good as Dexter ever got. Dexter would proceed to lose its way again and again over the next seven years (as did later volumes of the book as Lindsay’s narratives grew increasingly florid and tacked a supernatural element onto Dexter’s Dark Passenger). But “Born Free” suggested everyone involved understood the character and where he was going. Availability: “Born Free” is available on DVD as part of the Dexter: The Complete Series Collection. It can also be streamed from Netflix and Showtime Anytime.